What do Neil DeGrasse Tyson, Newton’s Third Law, and my torso have in common? Newton’s Third Law, the action-reaction law, says that if object A exerts a force on object B, that same force is also felt by object A (in equal measure and opposite in direction). It’s far harder to run with tennis shoes on ice – the movement – than on land, because there is much less friction and, thus, a less stable base. I was just recently able to stand up on my own, which is awesome, but I’m very unsteady and, if a force pushed me gently to the side, I wouldn’t be able to resist it to remain standing. For me to be able to take a step forward or lift a backpack off the ground – the movement – I must first be able to hold my body strongly in position – the stable base. This sequence is meant to illustrate that, in many different forms, stability is always necessary for mobility, and that is what I have been working on for the past few weeks with a spinal cord injury specialist. Notice how those muscles connect to other muscles, not just to bones, which is what we have all been told. It’s an absolutely fascinating and different way to look at the body, and has really helped me understand the complexity of our natural and automatic daily actions – movements that I am now teaching my body to perform using a different part of my nervous system. Ale has found a way to tap into the nerves that predictably run through this fascial webbing as a way to carry motor signals to other parts of my body, rather than just using the spinal cord to carry the messages farther down, which successfully happens continuously in an undamaged nervous system. Our focus has been on strengthening a few critical muscle/fascial ‘chains’ (as seen in those images) to stabilize my trunk, so that I may better connect to the muscles in my legs and arms. I initially underestimated the need for them to have a very solid base before they can properly move. I now see that this stability must begin in the pelvis, and all of the work I have done to this point has prepared me well for this different style. Now, I am not talking about the special strength and coordination needed for someone to do a standing front-flip, or to stay pinned to a granite cliff-face with just a few fingers. This is simply about being able to lean forward, even while sitting, and keep my abdominal muscles engaged while I use my back muscles to control the motion. If you bend over to lift a heavy suitcase off the ground, your back muscles feel the strain, right? 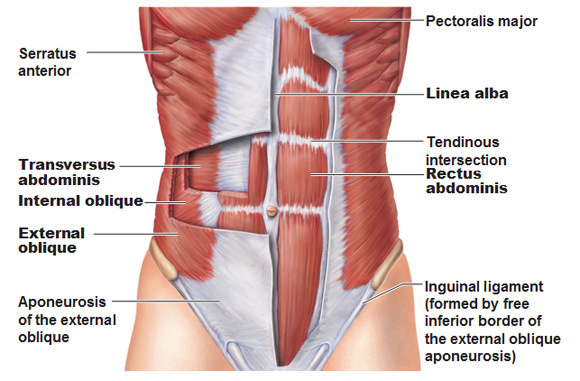 Well, if you engage the abdominal muscles (look at the layers!) more while lifting, you will better stabilize the hips and prevent excessive back-arching, and the motion will feel much easier. Call me unconventional for emphasizing the holistic approach – just like those yoga-obsessed, chiropractor-addicted friends we all have – but my body, and the compensations I’ve already developed, are proof that it’s not all bogus. So again, where it might well be possible to bend forward safely using only my back, and not my front, I will be compensating by straining my back muscles and joints. If someone lifts a heavy suitcase improperly a few times a year, nothing in the body will get damaged much. But what if I’m stressing my body like that each time I take a step, or each time I stand up?! Hopefully it’s now clear to the reader how important this balance is between stability and mobility, for everyone, but especially so for me. Here are a few examples of the exercises we do. They're slow and deliberate, and are some of the most mentally exhausting ones I've done. To ensure that the body is in the proper position, the standard protocol is to be shirtless. Today, I’m happy to share this more-complete picture of my exercises at SCI-FIT in Pleasanton, CA. The video was put together by my friend and trainer, Steve, and shows several routines that I have not previously posted. I hope you enjoy it!